The season has only just started, but has Mourinho already got it won? It's April 30 2012 and the Etihad Stadium in Manchester is bristling with hope and anticipation. For the first time in decades, the blue half of the city sniffs glory. The only thing obstructing it is their bitter rival, Manchester United. A win would give City a huge psychological edge in the title race, anything less would almost certainly result in the championship staying at Old Trafford. Again. Just seconds before half time, City win a corner. David Silva steps up and delivers a wicked inswinger with Vincent Kompany rising highest to deliver a bullet header to give City a lead they would not relinquish. "Manchester City's data department analysed about 400 corners in several national leagues over seasons, and concluded that the most dangerous corner is the inswinger: the ball that swings in towards goal," author Simon Kuper wrote for Le Monde Diplomatique. "The data team took this finding to City's manager Roberto Mancini, whose gut told him that the most dangerous corner was the outswinger. Mancini's assistant David Platt came to chat to the data analysts, and they noticed that City had begun taking inswinging corners. That season City scored 15 goals from corners, the most in the English Premier League." In a game of small margins, this was as small as they come, but it was enough. City's statistical enlightenment represents just one way the top football clubs are using complex data tools and armies of analysts in order to gain any slight advantage on the pitch. 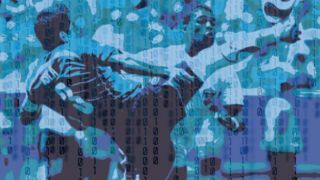 Stats readily furnished by companies like OptaPro and ProZone, and enhanced by powerful analytics software, are becoming king in all aspects of the game. They're being used to analyse in-house performance, to spot vital chinks in the armour of opposition teams and pinpoint areas that should be targeted. Performance departments give huge credence to a player's numbers when recruiting new signings. Swansea City pulled off, arguably, the bargain of last summer's transfer window when they signed Spanish forward Michu for just £2m. He scored 18 goals while £50m Chelsea striker Fernando Torres scored 8. Value for money, much? Blake Wooster a football analyst and founder of The 21st Club, an initiative that encourages clubs to quantify all aspects of their operation, told us: "Numerous scouts went to see the player, and didn't like the "look" of him. The data said he was under-valued, that his performance was high in relation to his buy-out clause value, and so it has proved..."
Simon Farrant, the Marketing Co-ordinator for OptaPro, which supplies data to Chelsea, Manchester City and the Brazilian national team said: "It's all about clubs trying to find little edges that were previously being ignored." It's all about clubs trying to find little edges that were previously being ignored. "Different metrics have become more important. I know a lot of clubs have talked about regaining possession in the opposition's final third being very important in contributing to the number of goals scored, but clubs who've discovered these edges don't tend to go shouting about it publicly, obviously." It's not just the clubs who're benefitting from the dramatic increase in available data. Fans also have access to astonishing volumes of information, enabling them to analyse metrics way beyond the basic stats served up by broadcasters, (admittedly hampered by time constraints and a viewer distaste for on-screen graphics) only making use of around 5 per cent of the data available from Ofcom. One of those services is the free second-screen app Squawka, which licenses Opta data and feeds 500 million data points per game (up from 14m last season) and into its complex algorithms. All in real time no less, bringing up to the second data while the game is going on. Squawka takes everything Opta dishes out. As a result fans can see exactly where on-ball actions like fouls, interceptions, passes, headers, duals and take-ons happen on the field. They can see where corners, shots and through-balls are directed and which were successful. They can match players and teams up against each others in visualised, easy to understand "red is good, blue is bad" charts. All of those data points, or "on ball actions" are funnelled into create Performance Scores – a statistical, opinion-free means of rating a player's contribution or a team's display on any given day, in any given league, across any given season. The London-based company's founder and CEO Sanjit Atwal told TechRadar: "I think it says lot about the football fan mentality that emotion usually overrides everything. In the past there hasn't been the scientific data to back up those emotions. "We're working really hard to built the kind of metrics where football fans can have those common conversations with others. There needs to be this objectivity, these centre-points where you can actually have a proper conversation. There could be a fundamental shift in the way the sport is played using this data. "If people are having an argument with a friend about football and one guy says "your player is" rubbish, we want to give them the ability to say "your player's rubbish and here's why" we want to fuel that "because" by giving them all the information they need, visualised. "Level of analysis is only getting better. If we achieve what we have the potential to not only will we have a great second screen platform for football fans in real time. I also think there could be a fundamental shift in the way the sport is played and managed using this data."